As explained in this post, the Starz Denver Film Festival is once again upon us, and I will be relating my experiences with the various films I see in daily reports, which will compile my thoughts on multiple films within single articles. For all Starz Denver Film Festival 2014 coverage, please visit this link. This was another terrific day at the festival, with two fantastic new movies I am positively elated to have seen, one retrospective screening that brought a beloved classic into sharper cinematic focus, and one movie that…wasn’t very interesting at all. But it at least kept me warm during today’s awful weather, so there’s always that. 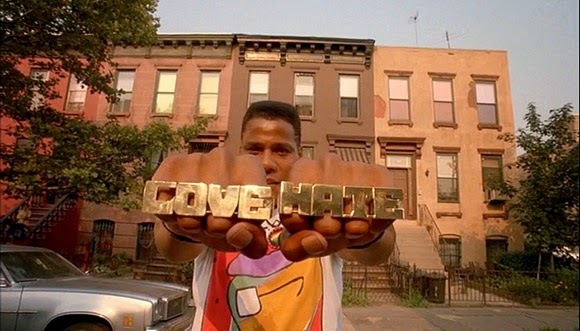 My second day at the festival began with a retrospective screening of Spike Lee’s seminal 1989 masterpiece Do the Right Thing, which was presented on a gorgeous 35mm print. I think the film is one of the all-time great American movies, a film that should exist in the same sphere of conversation as classics like The Godfather or Citizen Kane for how powerfully and intelligently it presents race relations in modern America. Seeing the film projected theatrically, on a print no less (this is a beautiful and colorful film, and shines ever so brightly on physical film stock), only reinforced my love and admiration for what Lee achieved here. Even putting the film’s racial politics aside, I think there are few American movies that paint such an immersive portrait of a community, or that populate their setting with so many distinct, vibrant, and complex characters. The film is profoundly entertaining to watch, a singular experience that is a little unlike anything else, and yet it is also constantly working to illuminate the individual perspectives of each and every character, striving hard to understand everyone’s point-of-view in a world where nobody is particularly good at listening to anyone else. That’s where the film’s racial argument comes into play, and where Do the Right Thing is destined to remain relevant so long as people feel too wounded, vulnerable, or guarded to try coming to terms with those who are different. Do the Right Thing is an undeniably angry film, a passionate response to the real-life murders and race riots that fuel the film’s plot, but it is also a film about anger. Every character in the film is saddled with complex and valid emotions and viewpoints, and multiple viewings only reinforce how much each individual in the film is grappling with very real pain, confusion, or vulnerability; beneath the layers of rage and hysteria that color many of the exchanges between characters, everyone is dealing with something honest and relatable, and the genius of the film is that the closer one looks, the easier it is to see the clear, reasonable basis every character is starting from. It may sound overly simple to say so, but if everyone in Do the Right Thing simply spoke to each other nicely, and tried being polite and honest in their interactions with each other, much of the film’s conflict – including the violent eruption of the finale – would dissipate entirely. But that’s where anger comes in; everybody in this world is automatically on the offensive at all times, too driven by their own negative emotions and experiences to stop and consider where the person across from them is coming from. As objective observers of the action, we can see the shroud of anger clearly; but for the characters themselves, each caught up within this atmosphere of fury and distrust, it’s nearly impossible to see through anyone else’s eyes. But that is, sadly, the kind of emotional status quo that exists in America, especially where racial politics are concerned, and as the 25 years following Do the Right Thing have proven, it’s something that’s unlikely to change within any of our lifetimes. Do the Right Thing is a powerful film, a searing and scarring piece of work that refuses to go anywhere near easy answers and leaves everything more broken and complex than where it started, but it is not, to me, an inflammatory or incendiary film. Lee achieved greatness by approaching an impossibly challenging topic with a cool, level-head – as Samuel L. Jackson’s DJ character constantly urges everyone on the block to do – and the result remains one of the most ethically, intellectually, and emotionally complex American films ever made. Tonally, the next film I saw on Saturday – Tu Dors Nicole (You’re Sleeping, Nicole) – could hardly have been more different than Do the Right Thing, though I felt a similarly rewarding sensation of cinematic euphoria walking out of each screening. This excellent French-Canadian film, written and directed by Stéphane Lafleur, premiered at Cannes back in May, and follows a few weeks in the life of its title character, 22-year-old Nicole, as she spends her summer wandering aimlessly through life. This is a film that snuck up on me, both while watching and while contemplating it afterwards. A modest and restrained portrait of an extremely complex, utterly ethereal emotional state, Tu Dors Nicole is not a movie of major revelations or attention-grabbing moments, but a sharply observed, richly realized character portrait of immense cumulative power. It is a film about aimlessness, about the emotions and experiences that drive a person to feel completely lost in the world, but it keeps everything sublimated beneath a joyous and expressive exterior. Every part of the film plays as an extension of its protagonist’s psyche, and just as Nicole has a great deal of playfulness and energy to her, Tu Dors Nicole is a wonderfully idiosyncratic work, its off-kilter sense of humor and occasional interludes from reality creating a film that is exhilaratingly expressive. It is yet another film at this festival driven largely by expert cinematography. Beautifully photographed in black-and-white, the film is an aesthetic marvel from the get-go, a constant parade of rich, detailed, and evocative compositions that continually reflect Nicole’s aimlessness, confusion, and, on occasion, ecstasy. 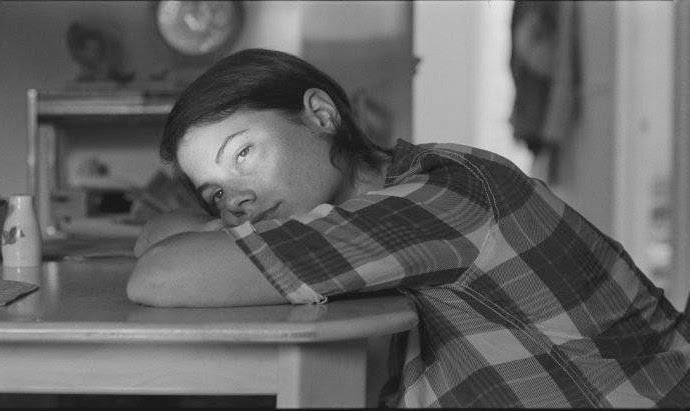 For instance, at the start of the film, Nicole’s parents have gone out of town, leaving her alone in their big, spacious house for the summer, and in the early going, the large amounts of space left within each frame – Nicole’s presence contrasted against large swaths of suburban emptiness – suggest a character who simply has too much space in her life. Devoid of most adult responsibility, and lacking anything she truly seems to care about too intensely, Nicole exists at a great distance from the world she seems bemusingly disillusioned with, and as the story progresses, and circumstances evolve – Nicole’s brother and his band set up shop in the house early on, and Nicole eventually has a falling-out with her best friend, and sole human touchstone, Veronique – the photography constantly adjusts to visually express Nicole’s interior being. Sequences of Nicole wandering alone through her neighborhood at night, gazing at lights and following cars, are among the most evocative moments I’ve seen on film all year. Nothing much happens in terms of plot, and character relationships continually move away from where convention, or even simple causal logic, might dictate; in fact, it’s even easy to become frustrated with the film around the middle, when it feels like it has settled into a calm, uneventfully repetitive rhythm that leaves Nicole stranded without any sort of character momentum. The film is significantly smarter and more skillful than that, though, and at a certain point – when Nicole’s life quietly starts dissolving around her, perhaps – I found I had unknowingly grown deeply invested in Nicole, feeling an intense empathy with her and hoping strongly that she might find a path towards happiness, or at least some sort of lifeline away from her isolated wandering. Even then, that is not the kind of film this is, and I think part of the movie’s lingering power is how resolutely it refuses to put a cap on anything, to give us any clear indication of where Nicole might go after the credits roll, or whether or not the experiences of the film have healed her in any significant way. Her life simply unravels to an understatedly low point, and then the film concludes with a marvelous bit of silent, playful ambiguity – a moment that could be read with equal validity as an eruption of internal power or an acceptance of personal stagnation, with a dozen other possible readings and sub-readings. Whatever the conclusion means – and if the film ever gets an American release, I would love to revisit Tu Dors Nicole and talk about this all in greater depth – it is infectiously emotional, an awakening of passion, in both Nicole and the viewer, that feels as appropriate an ending to any film as I have seen all year. So much of the film’s power comes from Nicole herself, of course, played absolutely brilliantly by Julianne Côté. It is performance of quiet reserve and control, yet Côté projects so many volumes of vulnerable personality; whether she’s laughing with Veronique, wandering her house and suburbs with a detached expression, or carefreely stealing clothes from her job, Côté illustrates a character who is hurting, somewhere deep inside, and even before the reasons for that pain are directly suggested, the character is profoundly identifiable at all times. A state of all-consuming aimlessness is a difficult emotional paradigm to discuss, let alone to depict cinematically, but Lafleur and Côté have done a terrific job of it here, letting the raw confusion of Nicole’s feelings say everything, and inviting the viewer to relate to these unknowable dimensions of human experience. Tu Dors Nicole is not, at first blush, a perfect film – the three main male characters are underdeveloped and uninteresting, and take up too much screen time – but with a character creation this accomplished at its center, the film is something special, and I hope it gets American distribution sometime soon. (As an aside, I think it’s inevitable some viewers and critics will compare Tu Dors Nicole with Noah Baumbach’s Frances Ha, both for the black-and-white photography and confused twenty-something female protagonist, but I think it’s a reductive comparison. Frances Ha is a movie about an ambitious young woman unable to get started with anything, even years after college, keeping her head barely above water in the demanding setting that is New York; Tu Dors Nicole is about a younger woman, only a few years removed from high school, devoid of ambition and disconnected from everything, feeling lost in a suburban space. They’re very different movies. A better point of comparison might be Lynn Shelton’s Laggies, starring Keira Knightley, which recently came out in theatres. I’m a big fan of that film, though I haven’t had the chance to write about it yet. It also explores a character who finds herself lacking passion in life, and starts making mistakes left and right as an adult; it’s a very different film, but as character-oriented portraits of emotionally nebulous nether-states go, I think it makes an interesting companion piece, especially considering the divergent philosophies the two films take to giving, or not giving, their characters closure). I had planned to spend the entire day at the Sie Film Center today, but after Tu Dors Nicole, where I had a block of free time and no screenings lined up, it turned out the only other compatible screening at the venue was sold out, so I braved some truly horrible weather to head on over to the UA Pavilions, the other main venue for the festival, to see if I could fit in one more screening. 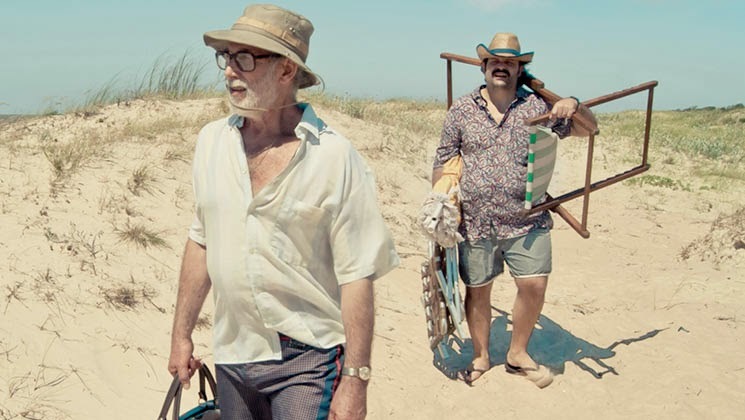 The film that turned out to be available was Mr. Kaplan, a film from Uruguay – it’s the country’s entry for the Best Foreign Language Oscar – that I had not heard of before. And to be honest, I think I would have been fine if things stayed that way. Mr. Kaplan isn’t a bad film, but it executes its intriguing premise in dull, overly conventional fashion, and left me feeling entirely disinterested by the end. The film follows a 76-year-old man, the eponymous Jacob Kaplan, who escaped the Nazis as a child and now, near the end of his life, wonders if he has made any impact on the world at all. He has been successful, and has a loving family, but he wants to make some sort of mark before dying, an existential crisis that spirals out of control until he finds himself obsessed with a local German bartender, whom he suspects may be a former Nazi in hiding. If he can catch this supposed Nazi and bring the man to trial in Israel, Mr. Kaplan reasons, then he will not only have done a good deed, but made a real name for himself in his old age. It’s certainly an interesting premise, but I suspect that were it to be done right, the film would either have to be a whole lot weirder, or significantly more serious. As it stands, Mr. Kaplan takes a pretty dry, middling approach to dramatizing Jacob’s quest, and none of it sits quite right with me. The ethical implications of what Mr. Kaplan is doing cannot be ignored – it’s racial profiling against an old German man, for starters, and Kaplan’s plan involves kidnapping the target and transporting him across international borders – but the film glosses over each and every one of them until the very end, when what seems intended to be an intentionally unfulfilling and thought-provoking conclusion instead rings as confused, unearned, and hollow. Along the way, Kaplan is joined on his quest by a stock sidekick character type – Wilson, a disgraced former police officer – whose every inch of progression is so rote and by the numbers that it barely registers at all. Mr. Kaplan himself stops developing as a character after the first act – his existential crisis eventually stagnates as the uneventful particulars of his investigation take over – and the film’s many attempts at humor are mostly cheap and unremarkable. The cast does some very good work, elevating the material as much as it possibly can be, but with uninspired characterization and inexplicably dull visuals (there are plenty of nice location on display here, all of which look thoroughly unremarkable), Mr. Kaplan offers virtually nothing to cling hold to. If Americans watched subtitled films, I could imagine it having some pretty broad commercial appeal – this is as down-the-line, middle-of-the-road as filmmaking gets – but I personally left the theatre asking myself what on earth was the point of the whole thing. Oh well. Afterwards, I headed back to the Sie Film Center for one more screening, but I’m going to hold off discussing that until tomorrow’s report. The film in question, Joshua Oppenheimer’s The Look of Silence – the follow-up to the masterful documentary The Act of Killing – is easily one of the great cinematic achievements of 2014, and one of the hardest-hitting films of the festival so far. I need a little more time – and a good night’s sleep – to fully wrap my head around it, and I look forward to giving the film the attention it deserves in the next report, where it will be discussed alongside the other screening I am attending on Sunday. Look for that report to post sometime Sunday afternoon. For now, I will simply say that this was another tremendously satisfying day of festival-going, Mr. Kaplan misfire aside, and I find it remarkable that in two days, I have seen at least a few of my favorite films of the year – all of which I doubt I would have a chance to see anywhere else anytime soon. If you haven’t been taking advantage of this amazing filmgoing opportunity, you should rectify that as soon as possible.